The Cumbria Way starts in the south of the county at Ulverston, close to Morecambe Bay, passes through Coniston and Keswick and finishes after 70 miles in Carlisle. Jason Friend has photographed the trail throughout the year for this book and a selection of these images won the Portfolio award from the Outdoors Writers Guild. 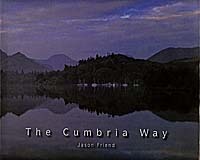 This is an ideal 'armchair book' for all keen walkers and lovers of Cumbrian countryside.